I was going through an old album the other day and came across this image. I had been creating cloth dolls from my own design for a number of years, but wanted to try polymer clay. This piece was sculpted from cernit (head) and fimo (hands). The body was wire, padded and wrapped. I can still remember how gorgeous I thought she was. Gosh I was proud of this piece and given everything I see wrong with her now ('flat' face, tiny mouth, too wide spaced eyes, large gnarly hands), I still have fond memories of my "first-born". I named her Niamh, and she went to live with a couple here in Ontario who purchased subsequent pieces from me over the years. My sister is attempting to clear out my Dad's house in Vancouver and has a large box full of mainly cloth dolls to send to me that I had sent Mom and Dad over the years. I only have a couple of cloth pieces from those years, and I'm looking forward to receiving these. I love to see pics of the evolution of an artist, so thought I would share my first polymer piece with you. Thanks for sharing Sue. I think she's beautiful. You've given me some inspiration for the day. I've been trying to force myself to try to sculpt my first "real" head, but I keep hesitating. I think I may actually try today! I still have every single cloth doll you made for me including the beautiful old fashioned bunny that I still adore to this day and my "mini me" with the brown yarn hair and purple dress, all put away downstairs at my parents house in my old pine toy box along with all the sweaters my grandma has made me over the years. They are prized possessions I can't wait to pass on to my future little girls! When you get the cloth dolls from your sis, please take tons of pictures and share them with us. This was your first??? Oh my she is gorgeous. I see no fault with her at all. An artist is always their worst critic!!! Someday I hope to have time to create with clay, till then I will admire all of yours! 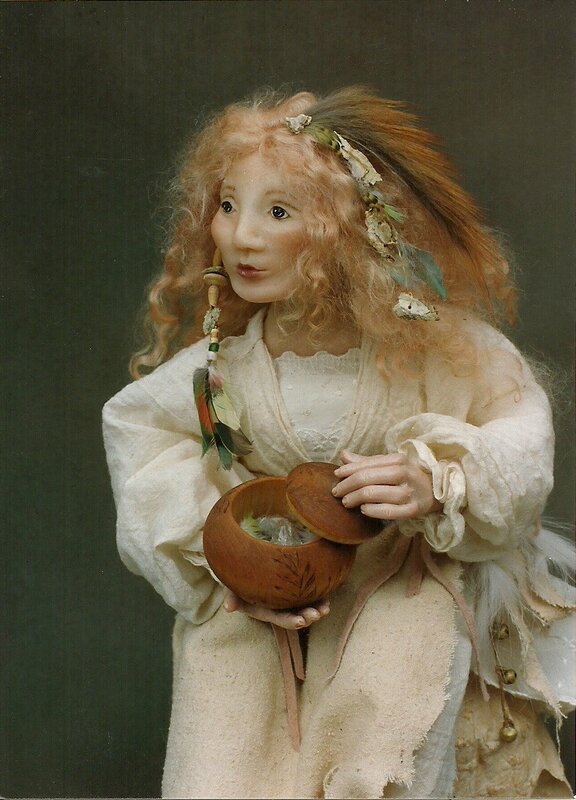 I can see the big difference between her, and your dolls now,yes--BUT she is still very beautifull-and a fantastic first piece, created from your hands,sweet. I will love to see your cloth dolls, when they arrive home to you. I think she is lovely. All the wrongs that you see in her actually make her an indivual character. I think she is lovely :) I cant believe she was your first doll, she is beautiful! this was a fun post. It makes me want to dig up my cd's of past work. how amazing that she is your first polymer sculpt! she has such character (and in fact reminds me of my auntie)! beautiful! Dear sweet Sue it's always good to remember our beginnings and I agree with all of the above!! !BTW did I ever tell you, one day my oldest dd said ," mom have you seen this artists work , her dolls are so amazing!!!" I looked and guess who she was referring too....yep YOU!!! I happen to think it's fabulous (as all your work is) and can see NO flaws...nothing but beautiful work...BUT we are our own vision so you may see things none of us will ever see. Love this little creation! Can't imagine it being a "first"...so well done! I would never be able to see any flaws in this "little lady"! Thanks for sharing! I think she looks great, we are our own worst critics. I hope you post pics of the cloth dolls that are on their way to you too! Oh my goodness! I htink she awesome! I "dpuble clicked" and her fingers are so realy looking! If she was your first - then you were absolutely born to do this! Wow Sue--That is an amazing first piece! A first try ! wow shes beautiful Sue!